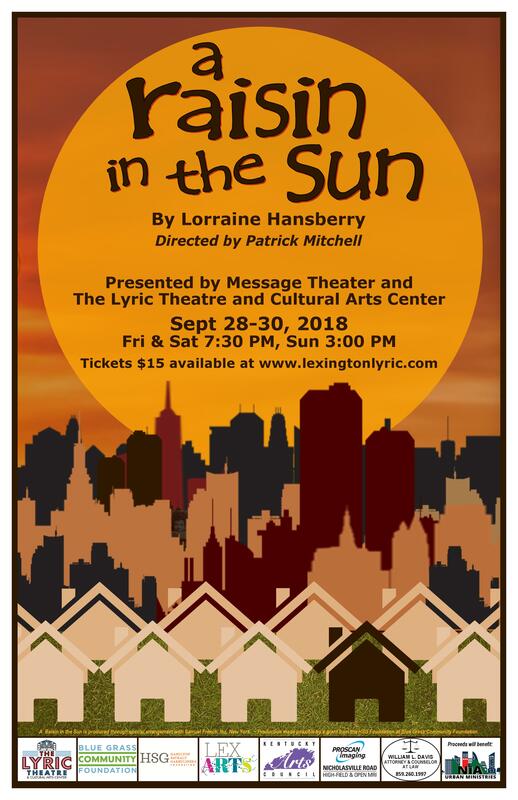 The Lyric Theatre & Cultural Arts Center and Message Theater are proud to present Lorraine Hansberry's 1959 classic, 'A Raisin in the Sun'. 60 years since its debut in 1959, 'A Raisin in the Sun' has continued to resound with generations of fans. Its timeless story of struggle and self-identity has a poignance and gravity that has influenced countless artists and adaptations over the years, and we are proud to add our names to this list. There are no groups better than Message Theater to present this masterpiece, and no more significant location than The Lyric Theatre's historic stage for its setting. Don't miss this one of a kind performance! 'Message Theater's mission "is to bridge the cultural gap in the Lexington Theater Community". Lorraine Hansberry's epic play has a timeless, resounding message for all that that bridge connects to as she masterfully touches upon dreams, motherhood, love and life. Part of our goal in the community is to provide a venue for artists to express themselves and The Lyric Theatre is the epitome of that effort. We are so proud to have local talent as performers, set builders, prop masters and wardrobe apprentices as the community experiences theater in a grand way. It is a winning package gifted for the community.' -Patrick Mitchell, Message Theater.